This traditional finishing sauce is a wonderful accompaniment to Carolina-style pulled pork. It is served on the side so you can use as much or as little as you'd like. The tart vinegar cuts through the luxurious richness of the pork, cleansing your palate and leaving you ready for the next bite. In the history of barbecue sauces, this recipe is closest to what was used since the early days of European settlements in the area. A sauce made with vinegar, black pepper, and hot pepper flakes was used to baste the whole hogs as they were cooked in open pits. Very little or no sugar is used in this kind of sauce. When used for basting, you want a sauce without sugar, as it can burn at higher temperatures. The brown sugar in this sauce gives it a little more of the sweetness expected in a finishing sauce. There is no danger of it burning onto the meat as you will use it to add to the pulled pork when you eat it. You can vary the heat of the sauce by adding more or less of the cayenne and red pepper flakes. Some like it hot, some don't. In a small saucepan, add the cider vinegar and brown sugar. Bring the sauce to a light simmer (do not boil), until sugar melts, about 3 to 5 minutes. Add the salt, cayenne, and red pepper flakes and simmer for an additional 2 minutes. Remove the sauce from the heat and let it cool completely. Store the sauce in an airtight container, jar, or squeeze bottle in the refrigerator for up to two weeks after preparation. It is best to wait 24 hours before using the sauce, as this will allow all the flavors to meld together. Serve as a side sauce for pulled pork or pulled chicken. In Eastern North Carolina, pork is often chopped and served. Pulled pork can be enjoyed as-is or on sandwiches. Sandwiches go on typical hamburger-style buns. The side dishes offered are coleslaw, cornbread, and hush puppies. The coleslaw can be served on top of the pulled pork in the sandwich, or on the side. A squeeze bottle is an ideal container for this sauce. It is a thin sauce without any herbs that could clog up the spout. You'll be able to give a squirt onto your pulled pork sandwich to season it perfectly. If your guests wonder where the tomato-based thick barbecue sauce is, inform them it is in Kansas City. Tomatoes don't get put into barbecue sauce until you head west. The sauce has some ketchup but is still thin when you pass Lexington, North Carolina. 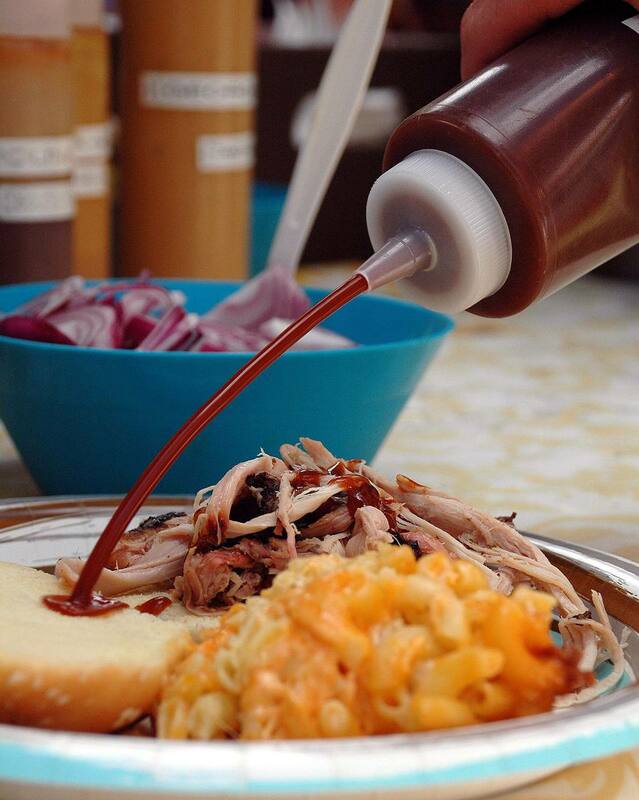 It's when you travel further west that barbecue sauce takes on the thick style seen in many bottled barbecue sauces.